Welcome! This 360 Meditation Visualization is one of a few unique meditation methods or types of meditation you'll discover in this website to assist your sacred, heroic journey to wholeness. As a spiritual life coach for thirty-plus years, I'm delighted to share it with you. This 360-degree meditation visualization is an all-encompassing circle, what I call "A Spherical View" one of many creative meditation methods. 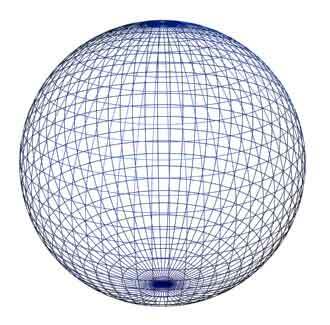 SEE the blue sacred space -- grid drawing of a round sphere? Meditating on it is one of the fun, mind-expanding types of meditation visualization exercises to augment consciousness. So, take a relaxing, comfortable slow breath. That's it... and a few more. Keep your breath sweet and soft. Okay now... notice how the sphere seems to move as you read here. Then, gaze up AT the sphere for a while. Open your mind and simply experience seeing the shape. Play a while... Does it seem to move as if it's alive and vibrating while you're reading? Hmm… watch your perception shift. Continue deep breathing... close your eyes to imagine in your mind's eye our beautiful round Earth. Visualize yourself IN this image of our planet. 'See' with your inner vision... feel how this image is very real -- it's a sphere. Right now in this moment take a few more long and smooth breaths. Ahh.. Relax. Be conscious of how you feel. A sphere is 360-degrees -- a complete circle. The philosophy of 360 is all-encompassing... nothing gets left out. Especially your Soul-Spirit! You ARE a beautiful Soul-Spirit. Built for my students and clients, this site has more thought-provoking spherical strategies for you to discover: healing meditation methods of various types of meditation to turn YOUR life around -- completely. You consciously create the empowered lifestyle that you choose from Soul's purpose. The key is to WAKE UP (as the Buddha taught) This was just a simple little taste… There's a lot more like this in my life-changing book, Doing a 360: Turning Your Life Around to Follow Soul's Purpose. Thank you for checking it out at Amazon. I so appreciate your support by buying my books. You're invited to journey around this heroic circle. Remember, this is YOUR circle, your life. I'm not suggesting that you re-invent the wheel. I suggest that you think outside the box... and enter your own sacred spin zone. I'll help guide the way… As a theme throughout Doing a 360, my spiritual guidebook just mentioned: "If I can do it…you can, too."